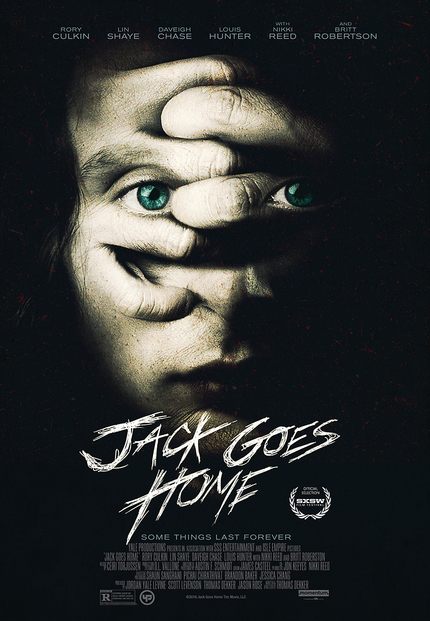 A new trailer and a one sheet for Thomas Dekker's sophomore effort Jack Goes Home dropped recently. We have both here to share with you. Jack Goes Home had its World Premiere at SXSW last Spring and was promptly picked up by Entertainment One and will be released in US cinemas and On Demand/Digital on October 14th, in time for Halloween. Jack Goes Home stars Rory Culkin (Scream 4, Intruders), rising star Britt Robertson (Tomorrowland, Under the Dome), horror film's matriarch Lin Shaye (the Insidious series), Louis Hunter (The Fosters), indie stalwart Natasha Lyonne (Orange is the New Black, American Pie), and Daveigh Chase (The Ring, Donnie Darko). Jack Thurlowe (Rory Culkin) is a successful magazine editor with a beautiful fiancée Cleo (Britt Robertson) who is seven months pregnant with their first child. However, this perfect life is turned upside down when Jack discovers that his parents have suffered a brutal car accident back in his hometown. His beloved father has perished while his mother Teresa (Lin Shaye) has survived. Upon returning home for the funeral, the volatile nature of Jack and Teresa's relationship boils to the surface and the constant barrage of sympathy from the town starts to weigh on Jack's grieving process. With the arrival of a mysterious new neighbor, Duncan (Louis Hunter), Jack finds audio recordings and video tapes left behind by his father that lead him to question childhood memories and the very foundation of his identity. With pressure mounting and sanity crumbling, Jack comes to learn that the idyllic world he has believed in since infancy is in fact a nightmare playground full of lies, deception, violence and murder. There are an awful lot of 'Sorrys' at the end of this trailer. Are we sure that the big reveal about Jack's past isn't that he was adopted from a Canadian orphanage? You know, because we say 'sorry' a lot up here. I'll just be over here saying 'sorry' for the bad joke.